Limited deluxe vinyl edition, existing of three LP's containing 25 new tracks of the band. The records are pressed from beautiful transparent vinyl and packaged in an attractive hand-numbered gatefold sleeve with artwork by Steven Lapcevic and including all lyrics. 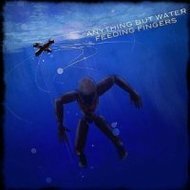 Here you can read how the collaboration between Feeding Fingers and Sounds for Sure came about. 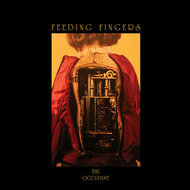 While embarking on a seven-and-a-half-week tour of Europe in support of their 2013 album, The Occupant, Feeding Fingers found itself at an impasse. Justin Curfman's private life in Germany had become stressful, a vortex of negativity that he realized he would need to change in order to move forward in a healthy way. He decided to reach out to his producers in an effort to, essentially, save his life and the life of his musical project. Becoming a full-time artist was a daunting and risky venture, but Curfman was determined to see it through – this, after all, was what he was meant to do – and his producers, Jim "Coyote J." Battan and Dana Culling, were willing to help him get to where he needed to be, both financially and emotionally. In March and April of 2014, as the band traveled throughout Europe playing shows in support of The Occupant, Curfman’s mind was on a future project – one which he had been longing to bring to fruition since he was just a boy living in Atlanta, long before Feeding Fingers even existed. Returning to Germany from the UK at the end of the tour, he set to the arduous task of researching musicology, music history, and theory which he would use, in broad strokes at first, to craft the foundation for what would eventually become Attend. Studying, reading, and working with music students from various disciplines in Salzburg, Austria, Curfman spent the rest of the spring of 2014 immersed in the realm of ideas. His mental workout continued on into June, as Attend was born, and Curfman began to write, fueled by his generativity and desire to inspire others. Taking inspiration from his studies, his past, and his personal struggles dealing with private turmoil and full immersion into European culture, Curfman began to compose music for the first series of songs for the album throughout the summer and early autumn months of 2014. A simple piano melody, recorded played on a kalimba and embellished with lush guitar, bass, piano, and soaring percussion would, by the second week of October, 2014, become the finished music for what would become Attend’s first single – “Your Candied Laughter Crawls”. November took Curfman to Italy, where he would record the vocals for this and several other songs he had completed in the interim at The Jack Studio in Naples. While there, he would work closely with violinist Marica Filomena Coppola, who would provide a stirring solo for “The Firstborn Stands Sedated”. Curfman spent three weeks in Italy, working in the studio and recording pieces of video and taking photographs for the video for “Your Candied Laughter Crawls”, on which he would collaborate with artist and animator Steven Lapcevic (USA) throughout the following few months. "Your Candied Laughter Crawls” was released as a digital single, with an accompanying vox-kalimba B-side version and Lapcevic’s music video, in January of 2015. It was well received, finding play on several podcasts and internet radio sites throughout Europe and the USA and with generally positive critical reviews. Encouraged, Curfman continued to write and record music, building his collection of new songs. By March, 2015, he had amassed fourteen tracks for this monolithic record – but he was just over halfway to his goal. “Polaroid Papercuts”, a track Curfman had been working on since early autumn of 2014, was released as Attend’s second single in March of 2015. 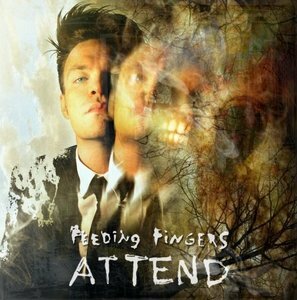 Featuring guitar work by Martin Bradley of The Death Notes (UK), it proved a more straightforward track in the Feeding Fingers sound. Taking footage from the 2014 Occupant tour, mixing in little personal moments here and there and applying a “home movie” overlay, Film Bizarro director Ronny Carlsson (Sweden) created a video for the single which would showcase a more intimate side of Feeding Fingers – a tack that the band had previously not explored in their videos. Throughout spring and summer of 2015, Curfman would find himself reaching out to all corners of the globe for musical inspiration and would begin collaborating with several guest musicians from many different styles of music. Never satisfied to remain squarely in the camp of any one genre, Curfman wanted to expand the Feeding Fingers universe to include sounds from as many different kinds of instruments as he could manage – from Indian and Chinese instruments to Wendy Carlos’s Alpha Scale, Ivan Alexandrovich Wyschnegradsky's quarter-tone piano and beyond, Attend is the result of a fully new tradition marrying the common themes of Feeding Fingers’ core sounds with international appeal. An experimental track played completely on glass, a song composed entirely for analog synthesis instrumentation, a track featuring a toy piano, even spoken word and completely atonal melodies – Attend is truly a mixture of modes and methods, knotted together in the sensibilities of its brilliant composer. Twenty-five tracks were completed for Attend in total, featuring such diverse guest musicians as pianist Shoko Nagai (Japan), erhu virtuoso Chuan Qin (China), saxophonist Ned Rothenberg (USA), pipa soloist Zhuxi Wang (China) and cellist Maja Backovic (Serbia), who also appeared on The Occupant.